"My name is Tom Goldman," a voice is heard announcing at the beginning of Bigas Luna's L.A.-set, English-language Spanish-American co-production Anguish (Angustia), "Welcome to our movie. As you've seen in the lobby, we have provided medical service which is free of charge on presenting your ticket stub. Oxygen masks are available…"
As the unseen Tom continues this arch introduction with conflicting advice to enjoy the film but not to hold the theatre legally responsible for what may happen, and certainly not to talk to any strangers during the projection, words appear on the screen declaring: "During the film you are about to see, you will be subject to subliminal messages and mild hypnosis. This will cause you no physical harm or lasting effect, but if for any reason you lose control or feel that your mind is leaving your body - leave the auditorium immediately." Next we see the title, and the film begins - although, of course, the film already has begun. Two things are established in this prologue. The first is that Anguish expressly advertises its own cinematic form and gimmickry, framing itself precisely as a film being seen in a movie theatre. The second is the formal disjuncture between what we hear and what we see. For although the voice and the text appear to be imparting similar information, they are in no way the same, and attempting to concentrate on both simultaneously and to reconcile their divergent content induces in the viewer something akin to a state of cognitive dissonance. This serves as an apt prelude (and primer) to all manner of discrepancies and paradoxes to follow, that will indeed leave your mind feeling as divided as the protagonist's. For already the film's 'mild hypnosis' has started working its spell, and soon, as the alienation effects accumulate and the paradigms keep shifting, disorientation and unease of a decidedly metacinematic bent will begin to take hold. 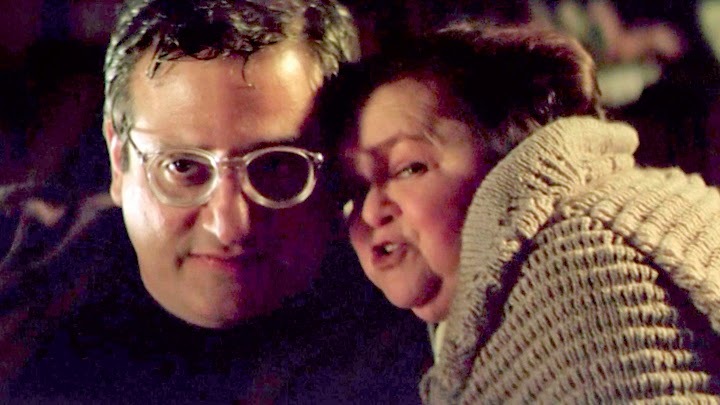 The film's protagonist - also its antagonist - is middle-aged, diabetic, bespectacled John Pressman (Michael Lerner), who works as an orderly at an ophthalmology clinic and lives at home with his mother Alice (Zelda Rubinstein). This repressed manchild is, like one of the snails that Alice confines to a jar, or the fluttering pigeons that she keeps in a large cage, unable to break free of his mother's malign, dominating influence, expressed through her acts of mesmerism. Meanwhile, Hitchcock's Psycho (1960) and The Birds (1963) exert a different, more cinematic, kind of influence over events. Alice hypnotises John, sending him on mad missions of murder against perceived enemies. There are several disjunctions here: it is never clear whether these extended scenes of bewitchment, with their mesmeric spirals, ticking metronomes and Alice's mantra-like phrases, are taking place in reality or just in the theatre of John's Oedipally crazed mind (although it is clear that we viewers are being subjected to these words and images of suggestive brainwashing no less than John is); and Alice seems not only to manipulate John's killing sprees, but also - impossibly - to see and hear what he (rather myopically) sees and hears, even when he is on the other side of town. This special bond between them, as much psychic as psychotic, serves as a potent metaphor for cinema itself, which uses sight and sound to transport viewers imaginatively beyond the cages of their bodies and the limits of their perspective to other places and personalities, and can perhaps even influence viewers' mindset and action. It is hardly a coincidence that the trophies which John takes from his victims are their eyes, the principal doors of perception for cinema itself - and it is even less surprising that John will carry out his final massacre in an actual movie theatre, with a film (The Lost World) playing in the background as a counterpoint to his own cinematic rampage. Not that Anguish lacks surprises - and at this point, anyone sensitive to spoilers, and unaware of the film's central conceit, may want to stop reading. Some 22 minutes into the unfolding of John's already rather psychedelic story, an audience is revealed watching his adventures on a screen in a theatre. What they, and we with them, have been viewing all this time is The Mommy, directed (as a poster in the lobby reveals) by one 'Anul Sagib' - and just as that name is Bigas Luna spelt backwards, The Mommy is the hidden reverse of Luna's own film, a mise en abyme that reflects all the themes of Anguish while bleeding irrationally into its texture. Even as The Mommy continues to play at the Rex, we see its differing effects on a range of viewers. While Alice performs her trippily hypnotic rituals, several audience members can be seen staring at the screen in a dazed trance, as enthralled as John. When John kills several cinemagoers sitting in front of him, viewers in the Roxy check nervously behind them (with us, of course, watching The Mommy over their shoulders). "I don't want to see this," comments Patty (Talia Paul), showing all the physical symptomatology of someone in a state of extreme agitation and distress, "It's making me sick. Linda, Linda, I wanna leave!" "It's only a movie," Linda (Clare Pastor) insists sensibly, "This is fun!" - but Linda is mistaken. For not only are sensitive, suggestible viewers like Patty highly receptive to the dark magic of films like The Mommy, but sitting near Patty and Linda in the audience is another kind of cinemagoer (Ángel Jovè) - an obsessive, repeat viewer of the film who over-identifies with John and is intent on imitating and realising the orderly's fictive slaughter. Alice's influence, it seems, has extended beyond the lost world that she inhabits - and beyond the screen - into downtown Los Angeles. Much as viewers of Anguish were tasked with taking in conflicting text and voiceover in its opening scene, now they are confronted with two films (both taking place mostly in theatres) running in parallel and in a complicated dialogue with each other that will turn out not to be one-way. Watching this is a deeply disorienting, dissociative experience. It carefully positions us as viewers in a cinema (which we already are, unless we happen to be watching at home or streaming), only to unsettle our status repeatedly in its hall of metacinematic mirrors. Here we risk becoming trapped in the conflicting desire to keep watching a horror that seems to permeate the very space in which it is being exhibited, or to remove ourselves to the (not necessarily safer) refuge of the lobby or of the world beyond cinema (if such a world really exists). Once Alice's hypnosis has taken insidious root in the viewer's mind, perhaps there really can be no escape - only a choice of whether to become killer or victim. Anguish is horror at its most sophisticated and self-reflexive, using cinema itself - its projections and imaginative impacts - as an arena for anxiety-riddled ideas about what it means to surrender ourselves to someone else's sinister, suggestive vision. At times darkly funny, this is a beautiful kaleidoscope of freakout imagery and jarring juxtapositions. Just hold onto that ticket stub - after all, it may admit you to the theatre, but it also lets you get a breath of fresh air from outside.